To learn to ‘read and write and cast accounts’ was the ambition of Olney parents for their children 240 years ago. These were the tradesmen of the town who needed their sons to be able to follow them in their businesses. This need was met by the school on the Market Place, held in the Shiel Hall, and is the earliest record of a school in Olney, though the date of its establishment is not known. 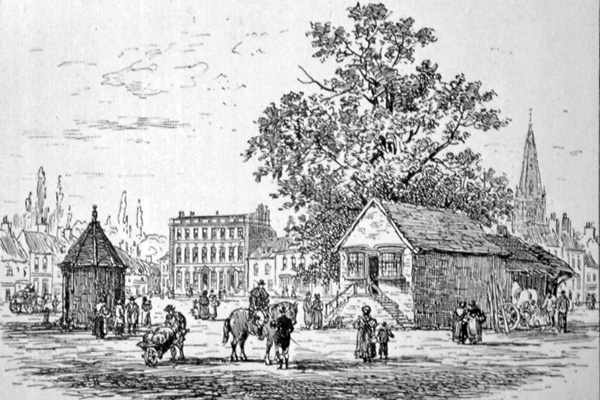 However, by 1791, the building was being threatened with demolition. The Revd. John Newton instigated the appointment of Samuel Teedon as schoolmaster in 1775. It would appear that this was a Parish School – one set up for the benefit of the children of the parish and the Schoolmaster received the children’s ‘dues’, which were paid quarterly. 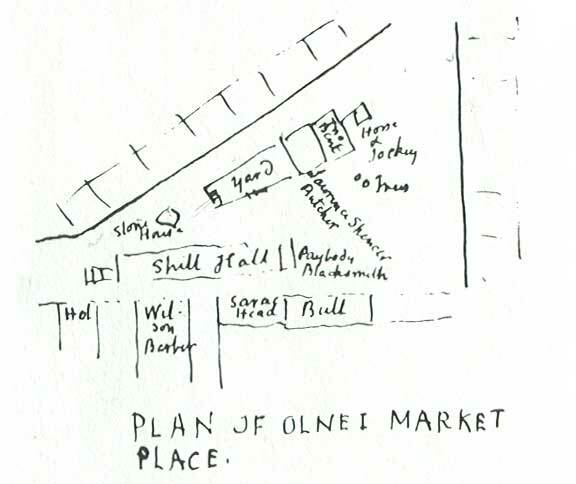 The Parish of Olney would pay the schoolmaster a small salary out of the Poor Rate or Church Rate. Townspeople might also make voluntary contributions in kind or money towards his livelihood. Samuel Teedon kept a diary and noted several times ‘received quarterage from Handscombe and Hull’ . These men were probably the Overseers of the Parish at that time, appointed annually at the Vestry Meeting. He wash’d those hands of trade and Olney sought’. Teedon lived in a cottage at the junction of Dag Lane (now Weston Road) and High Street South (where now there is a row of shops), with his ‘cousin’, Elizabeth Killingworth (known as Mammy), her son Eusebius (known as Worthy) and Polly Taylor, possibly Teedon’s natural daughter. Teedon kept a diary from 17 October 1791 to 2 February 1794, and from this we get details of his school, his pupils and his other teaching activities. Other revelations include his social contacts, local events, his financial state and the charity he received. Teedon’s personality comes through from comments and habits he recorded, his family life and religious activities and also his involvement with the poet, William Cowper and the household at the Lodge, Weston Underwood. Here, though, I am just concentrating on the entries relating to his teaching activities and have retained Teedon’s erratic spelling. 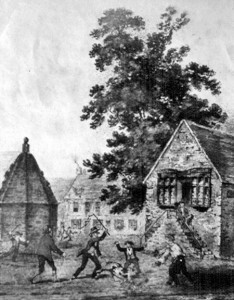 Teedon began his diary at an unusual time of year, October 1791, possibly because he was threatened with the demolition of the Shiel Hall at that time. 22nd October 1791: M[aurice] Smith called me to tell me my School would be pulled down etc. I replied I would be glad of it if they built me another etc. 23rd October: I informed Mr Hardwick of the pull[in]g down of Sheil Hall etc. 26th October: I writ to Mr Newton about the subscription to pull down the school. Mr Bean (Vicar) came to my house and writ a direction, S. Thornton Esq M.B. London. 2nd July, 1792: I was assaulted with reproach by Ashburner with Raban, who intercepted my Note which I sent him by Perry [to] inform Raban (Parish Clerk) of the pulling down of the old shop (blacksmith’s forge adjoining the Shiel Hall). I went over to the Esqr. (William Cowper) and informed him of it, who desired me to go to Raban and inform him and write down his answer, who defied them to touch the school etc. 23rd November 1792: I could not bare the school on Acc[oun]t of the Smoak. I went to Mr Bean (the Vicar) and he advised me to go to Mr Wright (Lord Dartmouth’s steward) at ½ after 2 who ordered Mr Raban to repair the Chimney etc. The day school was for boys, whose ‘salutation’ required them to ‘take off their hats before the Master and to scrape their feet along the floor’. Those pupils that were mentioned by name were the sons of tradesmen, farmers and the Minister of the Independent Meeting (now the United Reformed Church). Teedon also taught the Vicar’s son ‘Writing’, but at the Vicarage. Teedon also ran an evening school for girls, where more domestic skills, e.g. needlework, were probably taught by a female member of Teedon’s household. 2nd January 1792: Five of the girls came in the night school. 24th September 1792: Ann York came again to sewing and brought harvest home fare plenteously. There was a measles epidemic in May 1793, which affected his pupils and in September of that year, one of his pupils (Poly York) died, though the cause of death is not given. All the school was invited to the funeral. Teedon’s pupils occasionally transferred to other schools and he got very upset when this happened. 16th April 1792: Much mortified in hearing Hull’s boys were to go to Ravenstone after I had done so well by them’. Teedon had trouble getting money due to him out of Mr Hull afterwards! 8th January 1794: Sally Rubythorn said she was to come no more but to Bedford…. Was quite composed tho’ Maria Nicholls brought her sister’s money and said she was to make up her Q[uarte]r and she was to go to Daintry’ (Daventry). 27th June 1792: The Quillman called, he asked 11/- for 12 hundred of the long thousands. I offered him 8. He offered them at 10/6. 9th October 1791: Mr Bean (the Vicar) came about 10 of the clock to offer me the Schoolmaster’s place to the Colony of Sierra Leon[e]. I did not give a direct refusal, which occasioned a terrible conflict at home. At 4 he came again to the school to read Mr Thorton’s Letters and Mr Newton’s. I gave a decided refusal on Acc[oun]t of the clime. As you will hear in a later ‘instalment’, there were private boarding schools for girls around the Market Place and Mrs Sample’s was one. Her husband invited Teedon to come and teach her pupils writing. 23rd July 1792: Mr Sample called to engage me. 24th July 1792: Went today to teach at Mr Sample’s. 22nd January 1793: Becky Sample (daughter of the school) mar[rie]d today, so I did not teach at 12. 28th January 1793: Miss Harriot Marshall began writ[in]g at Mrs Samples. 5th March 1793: I did not go to Mrs Sample’s who excused me on acc[oun]t of Worthey’s illness who seemed no better. 8th March 1793: Worthy at school today. This sounds as if Worthy Killingworth taught at the school when Teedon was at Mrs Sample’s. It has been said he was Teedon’s Assistant, though he was a bookbinder by trade. A contemporary account confirms this as it states Killingworth, while Teedon lived, did not attend the school ‘of a morning’, and describes Worthy: ‘He was a neat book binder, an art which I imagine he had gained by his own ingenuity: a stout-made man, about five feet five or six inches, very little of a talker’. 1st May 1793: Did not go today to Mrs Sample’s, she going to the Minister’s meeting at Newport. 22nd July 1793: At Mrs Sample’s again. Miss Abraham, Cran and Davis. She said if I brought the bill she would pay me all the 3 Misses ‘due’, viz. Marshall, Pell & Dowley. 23rd July1793: I rec[eive]d £2 0s. 6d. of Mrs Sample. Impression of the former Sheil Hall by William S Wright, father of Thomas Wright. 2nd September 1793: Miss Dowley among the ladies for the first time after the Mid summer Recess. 22nd September 1793: I did not go to Mrs Sample’s, she going out to take a walk with the children. She sent her comp[liment]s inform[in]g me in the morn[ing]. 10th December 1793: I broke up School today at Mrs Sample’s she giving over intirely tomorrow for a month. Samuel Teedon died in 1798, after only an evening’s illness, and he was buried in Olney Churchyard on the 9th June in an unmarked grave. So what happened to Teedon’s School? The Posse Comitatus of the same year (a list of able bodied men eligible for service in the militia) that Samuel died (time of year of compilation unknown) lists two Schoolmasters, Thomas Haddon and Edward Lambert. 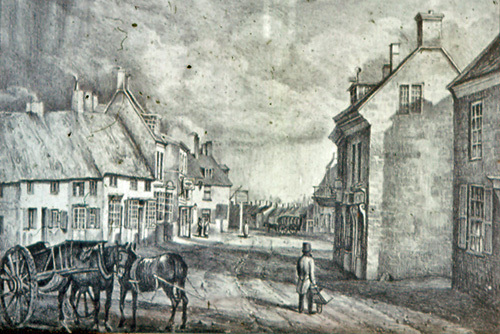 Haddon’s private school was in the High Street, of which we shall hear more in another instalment, so it could be that Edward Lambert was the schoolmaster who replaced Teedon. However, the 1821 Census lists Killingworth and Lambert as schoolmasters, both living in High Street South but in different properties. 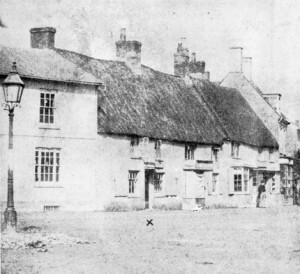 Killingworth was still residing in Teedon’s former home and Lambert was living nearer the Swan public house. Maybe they were both at the Shiel Hall. They were both between 60 and 70 years old at this time (1821). The contemporary account mentioned above also stated: ‘Killingworth, Assistant to Teedon , he carried on the school after his decease. A French reader, he was a beautiful penman – a first rate arithmetician, algebraist and mathematician, superior in all these respects to Haddon who set up a school after Teedon died, and carried away the interest’. However, as neither Killingworth or Lambert is listed under ‘Academies’ in Pigot’s Directory of 1823, presumably the school had closed on the demolition of the building around that date. The next instalment addresses Mrs Sample’s Boarding School for Girls c. 1790 – c. 1809.